Arlington Public Art is an internationally renowned, award-winning publicly and privately funded program. The program has been recognized by Americans for the Arts, DESIGNArlington, and other associations. Christian Moeller created Quill, a new perimeter enhancement for the Dominion Virginia Power Substation in Rosslyn as part of Monday Properties’ 1812 N Moore Street project. Moeller’s design spans the Nash Street façade with additional treatments visible on N. Moore Street. The design was inspired by the successful return of the bald eagle to nesting along the banks of the Potomac River after years of being threatened with extinction. 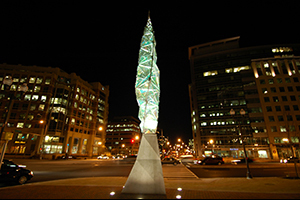 As a member of Penrose Square’s landscape design team, Richard Deutsch created this interactive sculpture inspired by the Three Sisters Radio Towers, formerly located near Columbia Pike and S. Courthouse Road. 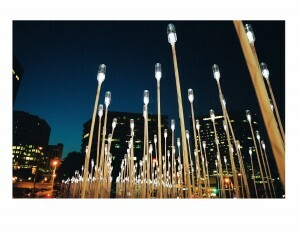 CO2LED was a temporary project that promoted the use of alternative energy sources by using nearly 700 solar-powered LEDs (light-emitting diodes) secured to rods of varying heights, each topped with a reused plastic drink bottle. The poles’ slight flexibility, combined with the LEDs’ nebulous glow underneath the ridged surfaces of the plastic drink bottles, created a soft, undulating cloud of light. Flame‘s helical form is composed of dichroic glass joined with a steel framework. Dichroic glass exhibits different colors as it reflects or transmits light. Acting as a beacon to those entering and leaving the Ballston neighborhood, Flame‘s appearance is in constant flux as lighting conditions shift. 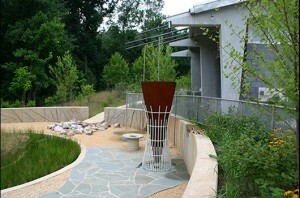 Jann Rosen-Queralt integrated public art into Cultivus Loci: Suckahanna, a rain garden designed by the landscape architecture firm Oculus, at Powhatan Springs Park. The garden collects and filters storm water run-off from the paved areas of the park. Cultivus Loci means "cultivated place" in Latin, and Suckahanna is the Powhatan word for "water." Memory Bricks grew out of ArtsWork, a summer employment program for creative youth. Under the direction of Owens-Hart, seven apprentices created decorative bricks and organized three community events where residents could customize their own bricks. Images of Sankofa (a West African symbol representing learning from the past), churches, and bibles were inscribed into the bricks as well as names of Halls Hill/High View Park residents and ancestors. 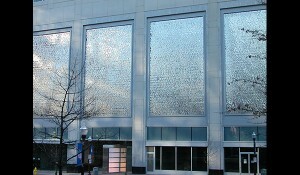 Liquid Pixels, by Ned Kahn, consists of six 42 x 25 foot vertical sections mounted on the north and west sides of this building. The six panels are covered with 630,000 one inch diameter disks affixed to low-friction pins. The disks move freely on their pins in response to wind, thus revealing invisible natural patterns. As light passes over the disks the glittering effect mimics water cascading down the façade. DESIGNArlington is a biennial awards program that recognizes excellence in design, showcasing the distinctive architectural, historic preservation, landscape and public art projects in our community. This awards program highlights Arlington's architectural diversity and some of our best examples of design. Winners cover a broad spectrum of the built environment, from commercial and residential renovations, to new construction, public spaces, and public art. 2015: Arlington Blvd. 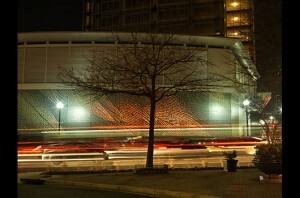 - Route 50/Arlington Blvd. from Courthouse Rd. to 10th St.
2015: Ripple (Water Pollution Control Plant Fence Enhancement) - 3402 S. Glebe Rd. Every year, IDA recognizes outstanding improvements to downtown by the work of dedicated individuals around the globe through the Downtown Achievement Awards. These exceptional projects highlight organizational advances in a variety of categories and stages of completion. The 2015: Public Space Award was given to Ballston BID's Public Displays of Innovation. 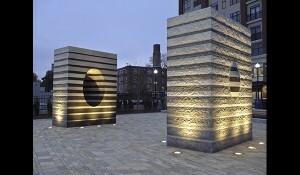 The American Council of Engineering Companies of Metropolitan Washington (CEC/MW) awarded Arlington Blvd, by artist Vicki Scuri, was an Honor Awardee for 2014-2015. 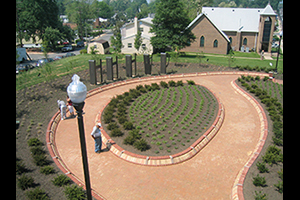 Long Bridge Park was recognized with a Merit Award in the Built/Design Category in 2013. Doug Hollis's Wave Arbor was noted in this award given for superior professional accomplishment.